Almost every employer has been in a situation where he realises that he has got a problematic employee who needs to be disciplined. The employer or manager might be tempted to overlook the problem in order to avoid disruption of peace. They might also be tempted to overreact out of anger and frustration. Experts on human resources have pointed out that the best way to administer discipline in the workplace is by conducting a one-to-one, private interaction that concentrates on behaviour. The issue should never be ignored. Properly administered discipline in the workplace helps a business stay away from several common problems and helps the company in a number of ways. Fairly and consistently applied workplace discipline reinforces the norms that have once been established for maintaining conduct and improves employee morale. When disciplinary action or rules in a workplace are clear and transparent, when they are enforced in a consistent manner, and when they apply equally to every employee, employees clearly know how they are supposed to behave and where exactly they stand. Employees are more likely to acknowledge, accept, and respect the rules when they know well enough that these rules are going to be enforced. This reduces the probability that disciplinary actions are going to be needed in the days to come. The primary and the principal outcome of workplace discipline is that it controls problematic behaviour. The importance of this outcome is directly proportional to the seriousness of the offence. A worker who spreads rumours or engages in gossip might be an irritating factor, but a worker who causes severe workplace disruptions by coming late, defying authority, fighting with other employees, engaging in a futile small talk, wasting time, or bringing drugs or weapons to the workplace, need to be curbed immediately. Ignoring a worker who is displaying dangerous and erratic behaviour can lead to tragedy. Ignoring those who sow discord harms employee morale and thus reduces productivity in the long run. Most often, whenever discipline in the workplace is delayed, either out of a fear of giving rise to resentment, or a belief that it is a “one-time” offense, the erring employee does not understand that he has committed a wrong. Rapid correction that is gently administered helps the worker correct his actions while the problematic behavior is considerably easy to rectify. If an employee gets to continue his inappropriate behavior, he will be resentful and possibly confused when he is eventually corrected, as he will have the chance to argue that he has done similar things on previous occasions without any objection from the management. Other employees, seeing the erring employee behave inappropriately without control, would also be encouraged to act similarly themselves. Rapid rectification of problematic behavior averts the above mentioned negative events. Workplace discipline, when applied to maintain a company’s harassment or discrimination policies, might save the company from a bitter lawsuit if any employee thinks about taking legal action. If a female employee complains about harassment from a male supervisor, and the management fails to investigate the claim or after finding her claim to be valid, fails to punish the wrongdoer, the female employee might choose to sue the company. When harassment or discrimination claims are found to be just rapid, disciplinary procedures are able to lessen the probability of expensive lawsuits. Behavioral issues in a workplace need supervisors to take appropriate action in order to make sure that the issue is controlled and rectified. The significance of discipline in an organisation cannot be overlooked, as productivity, company profitability, and employee morale can get negatively affected. A positive attitude might solve a problem before it gets worse. However, discipline in the workplace policy should always be applied carefully by sticking to the policies of the company while respecting the rights of the workers. Misconduct, defined as an improper or unlawful behaviour or violation of duty, can include verbal abuse, unexcused absence, insubordination, dishonesty, continual tardiness, failure to follow company policies or rules, and theft. The most necessary reaction to employee misconduct at work is discipline. Every management should have tools for investigating any reported incidence of misconduct. The first and foremost step that a manager must take is to interact with the employee so that he gets a chance to clarify his actions. The next step is the collection of evidence from third party sources and the employee for determining if the employee is involved in any way in the reported misconduct. This investigation must take place before any disciplinary process action is imposed. The accused employee should be aware of the mistake or violation he has committed. The management should share every evidence that it has unearthed, with the erring employee. Once the investigation gets over, the management needs to decide upon the course of disciplinary action to be taken. At this point, the management must be careful to not get unnecessarily vindictive. It should stay away from inviting litigation by violating employee rights. Disciplinary actions that should never be taken include: cancelling an already granted vacation, assigning a difficult or unpleasant task to the employee, and altering the working hours of the employee. Disciplinary actions should always be restorative and should never humiliate or embarrass the employee in question. The management must collaborate with the HR department to formulate its disciplinary action plans. The HR department can determine an appropriate disciplinary action for misconduct and thus advise a punishment, termination, or suspension. Working with the human resource department ensures that every legal aspect of discipline is thoroughly covered and the proposed punishment is appropriate for the offense committed. Union representatives might need to be included when disciplinary action is taken. Employers and managers can apply alternative methods of discipline which might often be the best possible reaction to misconduct. The erring employee might be allowed to apologize publicly to all his offended colleagues. He might be made to undergo anger management therapies so that he can curb his own inappropriate behavior. However, these are all for minor offenses. These measures might not work if the mistake had been so severe that the worker must be suspended. The general and overall personality and character of the erring employee should always be thoroughly considered while taking decisions on how to deal with the instances of misconduct. Organisational discipline aims to create an amicable atmosphere of minimally acceptable behaviours from employees. It means adherence to the processes, systems, regulations, and rules of the company. Discipline helps in promoting a healthy organisational environment and ascertains smooth functioning of every department. Misconduct and indiscipline from employees influence every stakeholder including colleagues, supervisors, vendors, suppliers and customers. Concealing factual personal data or offering wrong information during recruitment. Defying the employment contract terms. Violation of the regulations, rules, and policies of the company. Lack of punctuality in attendance. Absence from work without a granted leave. Promoting unrest and inciting colleagues. Getting separated or absconding from the company without clearance. Making false or fictitious medical, travel, or other kinds of claims. Sexual harassment according to the laws of the country. Sharing or stealing confidential company information or intellectual property with outsiders. Disallowing colleagues to work or spending idle time at workplace. Engaging in political activities or publicizing political interests at workplace. Refusing to sign or submit performance appraisal sheets. Refusing to take part in training programs. Using indecent language or shouting at junior colleagues. Talking loosely or spreading rumors irresponsibly. Being discourteous to company visitors or guests. Concentrating on personal matters during office hours. Using company property for personal profit. Defying company dress codes during office hours. Being careless about security, safety, and company property. How to Manage Employee Discipline? Most employees value discipline and comprehend the implications of offensive behaviour. They prefer a certain amount of freedom in conducting their working day and appreciate predictability about expectations. The new generation employees appreciate objectivity, transparency, and work-life balance. Anything disruptive gives rise to rebellious attitude and negative responses. It is essential for a company to have an employee handbook or a policy manual that would clearly define the minimum behaviour expected in contexts like sexual harassment, leave, attendance, vendor interactions, employee interactions, and expense submissions. The policies must be regularly reviewed, updated, and shared with every employee. The outcome of policy violations must be clearly communicated to one and all. There should never be any discrimination in the enforcement of regulations and rules. The disciplinary steps must follow a “hot stove” principle that states whoever touches the stove is going to burn their fingers. This implies that the “burn” is impersonal, irrespective of whosoever touches the stove. The intention of disciplinary action is to transform employee behavior. Thus, disciplinary steps should rather be corrective, than being punitive. Such steps include written warning, verbal counseling, suspension, monetary deductions, and termination as the final option. Progressive disciplining action thus implies a chain of steps with escalating severity. Disciplinary steps taken against workers need to be tracked and forwarded to the human resource department so that the cases can be included in personnel files of employees. In offices where automated manager services are in operation, online records of disciplinary awards by managers can be an option. All emails and documents can be used as evidences in case of legal trials. An automated workflow-based system is recommended that would manage discipline by ensuring that employee files get automatically updated when transactions regarding discipline get initiated. Employees are often scared to complain against their seniors as there is scope for retaliation. This can result in senior staff committing repeated offenses. It is essential to create a transparent system. Communicating confidentiality to every employee is also significant. Just a handful of employees should be able to access disciplinary information and they must be nominated by the manager or employer. The management, on a quarterly basis, must review the discipline-oriented cases and also the actions taken in those cases. The drafting procedure of employment policies must be fair. While most companies strive to be profitable, the aim should be long-term growth, sustainability, positive employer-employee relationship, goodwill, and development of a satisfied workforce. Rules should never be made just for the sake of drafting rules. A preferred way is to name all rules and policies as “guidelines” and review those as per the environment of the organization. Policies of a company must comply with local regulations. There might be varying rules for different geographical areas, in case of multi-national companies and the policies must be addressing these rules. As labor laws have always been regional, the policy-makers must be careful. Modern companies create online helpdesks to address employee grievances and complaints. This lowers the number of disciplinary incidences and also helps in updating and reviewing company rules or policies so that those get aligned to the majority’s expectations. Discipline in the workplace is a kind of training where individual employees need to adhere to certain regulations that have been formulated to shape behaviours. It is essential to instil a disciplinary program in any company, large or small, in order to progress. 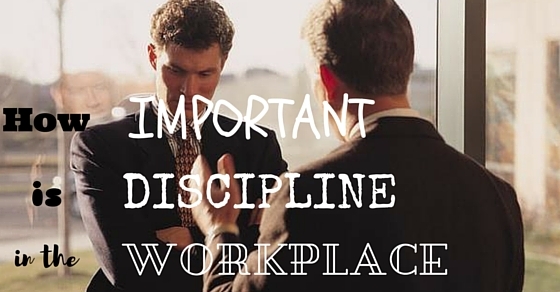 A disciplined environment in the workplace makes employees as well as employers well-behaved. Efficiency is the outcome of a disciplined workplace as discipline improves attitude and performance. Previous articleBody Language at Work – How Important is That? Next articleWhat is the Importance of Building Work Relationships?